2019 Regional Contests – Kansas Scholastic Press Association.. Welcome to the 2019 Regional Contests! KSPA is excited to host the hundreds of student journalists and their advisers from all over the state during these exciting days of competition. We are excited to see students apply their journalism knowledge and publications energy toward our contests. Each year, hundreds of students gain recognition for their journalism through the KSPA Regional Contests. Hosted at six universities, the contests challenge students to create their best writing, photography, design or cartooning. All students receive feedback from an expert judge and many receive awards for their work. Students who place at Regionals qualify for the State Contest in May where they can earn a state championship or other awards. Feb. 25 :: Regional contests at . . .
We hope that the Dec. 3 release of the digital submission prompts allows your students more time to create excellent, award-winning work. However, the KSPA board would like to remind all teachers and advisers that students are to work independently on the prompts. Teachers should not provide critiques, coaching or feedback in advance of the student submitting the entry. Similarly, if teachers use the Regional Contest prompts as assignments for classes, the teacher should not provide feedback on the students’ work. BOTTOM LINE: This is a student contest. Teachers are prohibited from helping their students. Over the past few months, KSPA — both its board and its staff — have been researching how to improve our programming for you. We are excited to announce the first of those improvements: a way to make the Regional contests both more fair and more convenient. We know the changes will encourage long-time members to keep competing. And of course, we would love for new schools to join in on the fun. This revised system would allow you, the adviser, to choose where your students attend their on-site contest. It’s true! For the on-site contests, advisers can now select any of our regional locations: Hays, Wichita, Manhattan, Emporia, Pittsburg or Lawrence. You no longer need to worry about where your school is “assigned” to compete. You’re in control. Plus, the KSPA staff will create more fair regionals with a more even number of schools in each. 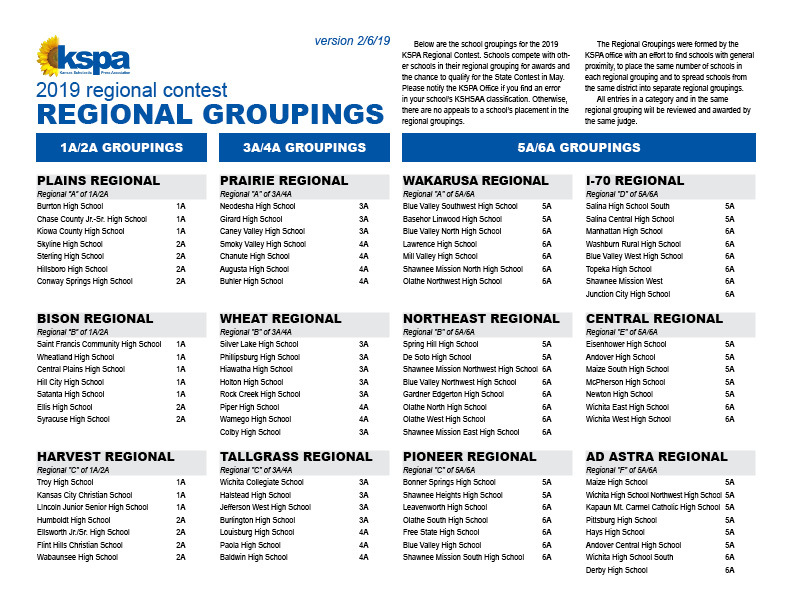 Rather than guessing at how many schools will attend a regional, KSPA will make regional groupings after we know how many schools are competing. Advisers simply complete an initial registration by Jan. 15. On this date, you will signal if your school is competing in regionals. At this point, you will also choose your location for the on-site contests. Simply choose the most convenient campus. The fee for initial registration will be $25 per school. Using those initial registrations, KSPA will create regional groupings based on the number of schools that register. For about every seven schools, KSPA will create a regional. So, last year, 43 schools competed in 5A/6A Regionals. That would create 6 regionals. We will be sure to publish regional groupings soon after that initial registration deadline. Plus, our digital submission system will automatically slot entries from your school into the correct regional grouping. Nearby schools will likely be in the same regional. However, we will avoid — as much as possible — clustering high schools from the same school district into the same regional. For instance, schools in the AnyTown School District might be distributed into a few different regional groupings, even though they are geographically close to one another. Ten digital submission contests will be offered. Please click on the links below for the 2019 prompts, including the submission link for each contest. In the Yearbook Theme and Graphics competition, schools may register . . . Initial registration costs $25 for each school. Initial registration allows advisers to choose their regional location for the on-site contest. It also provides the KSPA staff with necessary information to create regional groupings. The fee for each category entry remains $10. Once a school has registered for the contest, no refunds can be issued. Schools may register for additional entries but cannot reduce the number of entries. All payments are due to the KSPA office before certificates or judging feedback will be returned to the school. Schools should feel free to pay their initial registration fee and category registration fee in the same check if not using a credit card. Once initial registration closes on Jan. 15, the director of each contest site will send advisers additional information on parking, food facilities, location of registration and contests. Certificates will be awarded in regional contests to the first-place, second-place and third-place winners as well as to three honorable mentions. Award winners are then eligible to compete in the State Contest on Saturday, May 4, 2019 at the University of Kansas. and current advisers (advisers will judge entries from a different enrollment classification to avoid conflicts of interest). Please be advised that people with special needs will be given an equal opportunity to participate in and benefit from all contests sponsored by KSPA and the cooperating institutions that act as hosts. If you or any of your students need to be so accommodated, please let the appropriate contest director know what these accommodations are before Friday, Feb. 8, 2018. All results from the 2019 Regional Contests will be posted on the KSPA website. All first-, second- and third-place entries, as well as all three honorable mentions in each category, advance to the state competition, set for Saturday, May 4, 2019 at the Kansas Union on the campus of the University of Kansas. For the State Contest, registration begins at 8 a.m., with a general session at 9 a.m. and contests at 9:30 a.m. Return to our website for more details about the State Contest (including the digital submission contest prompts) as they become available in late March.